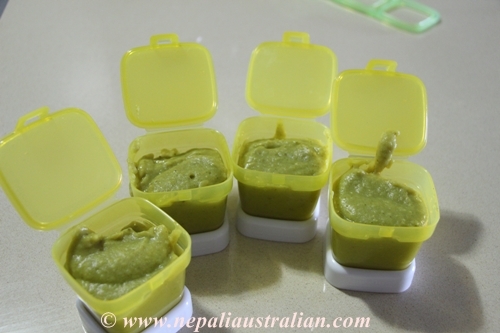 Since I started solid food for Chhori, I have given her Jaulo, Nepali rice veggie puree which is high in nutrition and quite filling too. It is so easy to make and versatile that I thought it would be helpful for any mum so I’m sharing the recipe here. 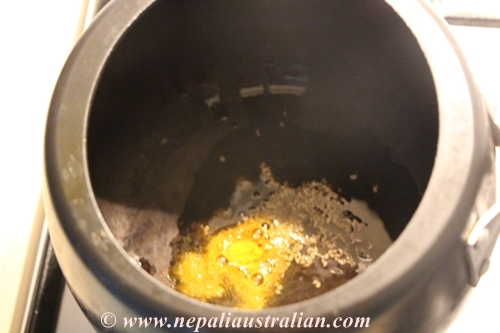 Heat the pressure cooker on medium heat and add ghee. 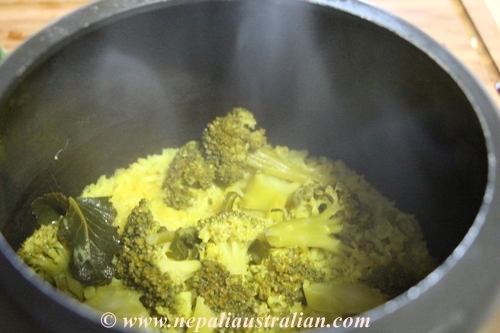 Let it get hot and add turmeric powder. Wash rice and red lentils. 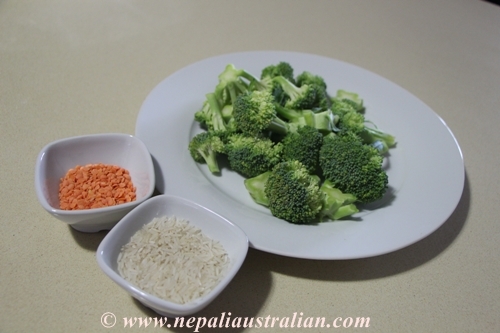 Add the rice, lentils, broccoli and salt to the pressure cooker. 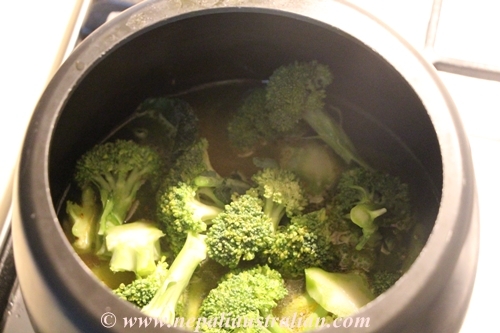 Add 2 cups of water, close the lid and let it cook. Let it press for 5-6 whistles. Once done, check if the rice is soft. 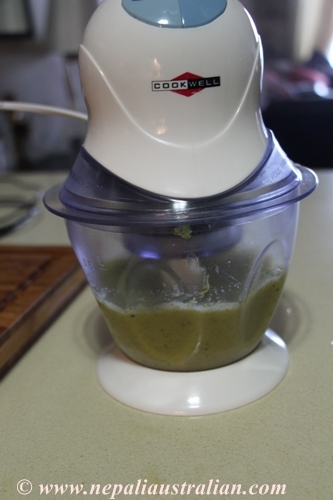 Put the mixture in a blender and make it a fine puree for baby under 7 months and coarse for baby between 7- 10 months. Older kids can be given the jaulo mashed using a spoon. 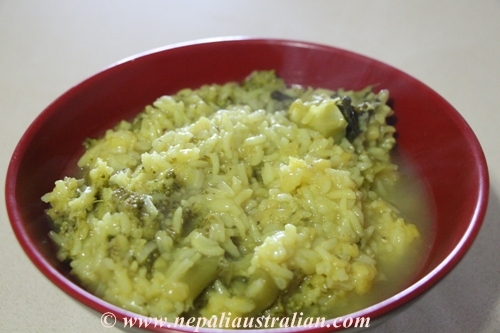 This can be made with any other veggies or lentils so it will be very versatile options for the baby and easy for the mum. Store in container and can be used up to 3 days when store in the fridge. 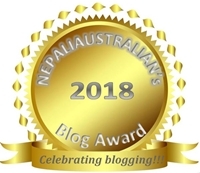 This entry was posted in Being Mum, Recipe and tagged australilan, baby food, easy baby food, M from nepaliaustralian, Nepali, nepali food, Nepaliaustralian, nepalli aby food, rice puree. Bookmark the permalink. I used to make enough for 3 days and freeze them and it was fine. If you don’t like to use butter or salt, you can make this without them and as the baby grows older can add them for taste. we just started on solids but he is not so interested in eating any solid food. Any tips to get him interested? I normally give Chhori a piece of carrots or celery when she is not very interested. So when she opens her mouth to eat that , I also feed her other foods. I know it is not always easy but make sure he is hungry enough when you give him solid food .Good luck. I would absolutely eat this – how delish! why dont you try Baby Led Weaning approach? you could find a lot of help online. I am not saying Purees are bad, but you could try BLW and decide for yourself. Excellent! You should turn this into something bigger. There is hardly any baby food blog in cyber space.